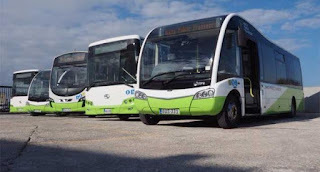 PARTIT KOMUNISTA MALTI: Communists support Transport strike for better working conditions. Communists support Transport strike for better working conditions. The Communist Party of Malta expresses its’ solidarity with Malta Public Transport workers in their struggle for better working conditions, healthier working environment and for an improvement in their wages. “The Government should take the advice of the new leader of UK Labour Party, Jeremy Corbyn who intends re-nationalisation of the railways transport network. In UK Nationalisation of public services will assure better working conditions for the workers, affordability of the service, and a better service for the public”, stated the Communist Party of Malta. A 50% emergency services renders the strike futile whoever supports this is a class enemy.